Brian Davies attended Chichester High School in the mid-1940s and after reaching sixth form prefect status in the 50s left to join the Royal Navy in 1952. I knew him well as out of school we were both members of the Bognor Regis Athletic Club. He was an excellent quarter miler and became a member of the Club’s Sussex record breaking youth mixed relay team The other thing we had in common was that both our families had fled the Luftwaffe’s ‘Blitz’ on Portsmouth. The Davies family lived in the next road to us at Bognor. Brian at eighteen joined the Royal Navy on an eight year short service commission as an aviation cadet. After initial flight training he went on to fly all the Navy’s principle jets notably the Phantom FG1. He attended the Empire Test Pilots School at Farnborough and was later attached to the USS Saratoga in the States. 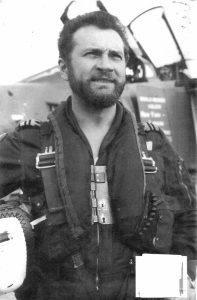 For his outstanding contribution as a Test Pilot for the development of this aircraft in its operational role on aircraft carriers he was awarded the Air Force Cross. It was when he was Commanding Officer of 892 Squadron, the last in the Royal Navy, the Navy embarked on what was to be its biggest public relations exercise namely entering the Daily Mail’s Transatlantic Air Race in 1969. The task was for a crew member to race from the top of the Empire State Building, New York to the top of the GPO Tower, London. Three Royal Navy Phantom aircraft were entered to race on separate days during the week 4-11th May. Their aircraft were refuelled by a Victor tankers aircraft en route over the Atlantic. Brian with ‘Pete’ Goddard his Observer were the last of the three and touched down at Wisley in 4 hours 46 minutes which stood as a Trans-Atlantic World Speed Record for five years. Unlike their predecessors they did not burst any tyres on landing! It was not quite over, the Observer had to helicopter in to a building site adjacent to the GPO Tower and then get to the finishing point at the top. Part of the post-race celebrations included being pulled on a gun carriage down Kensington High Street by the Fleet Air Arm’s famous Field Gun crew. Subsequently Brian was included in the Men of the Year List 1969 which included Jackie Stewart, World Champion Motor Racing Driver. When Brian left the Navy in 1972 he took up an appointment flying civil aircraft and finally settled in Storrington. He related his career in a book entitled ‘Fly No More’ (Navy Test Pilot – Mach 2.1 plus 75.000 feet). Several years later he sadly he succumbed to Alzheimer’s. I attended his funeral at St Mary’s Church attended by many of his former Royal Navy Naval squadron members. His ashes were scattered on the foreshore in Aldwick Bay, a place he loved.